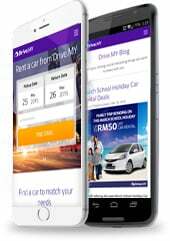 KK Leisure Rent A Car S/B, our proud partner of Drive.MY! KKLeisure Tour & Rent a Car Sdn. Bhd. Is a Sabah based company that was established in 2006. We are also offering car rental services at competitive and affordable prices for both private personal use and for the corporate sector. Our car fleet consist of more that 180 vehicles of various models and types ranging from small saloon cars, large saloon cars, 4 x 4, SUVs, and even MPVs. We ventures into this business with one clear vision and mission that is to provide a high quality tour packages with exceptional services and assistance from our dedicated ground staffs. We put our customer satisfaction at the highest priority in our business performance key result area . So we would like to say SELAMAT DATANG which is in English means welcome. Enjoy yourself while you are exploring our beautiful and exotic land of Sabah. Cherish the memories, leave nothing but footsteps and bring nothing but memorable beautiful pictures of your rendezvous. And don’t forget all the beautiful souvenirs as well. Jot down a line a or two on our feed back form about your experience and especially about us and our hospitality. Whether it is good or bad we will be happy to read your comments for it will become our valued references for building a better services for you in the future.